In 2013, at the mere age of 14, Kelontae Gavin was videotaped in a high school cafeteria singing "I Won't Complain." His performance went viral and a million views later, he is now one of the most buzzed about new voices in Gospel music! This young phenom possesses the stage presence and vocal finesse of an artist twice his age. 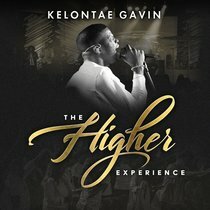 THE HIGHER EXPERIENCE not only showcases his passionate faith and vast vocal range, but also his preacher-like oratorical skills. This riveting recording boasts an exciting blend of the Pop pageantry of Hillsong United coupled with the fiery Pentecostal fervor of a take-no-prisoners band. Destined to be a huge hit, "No Ordinary Worship" was one of Billboard's most added songs in its first week at Gospel Radio, and it will soon be the calling card of KELONTAE GAVIN. This debut album also contains many other standout tracks, which will definitely provide listeners with THE HIGHER EXPERIENCE they've been craving! Kelontae Gavin is an energetic contemporary gospel vocalist from Ridgeville, South Carolina.